DS Kingdom Hearts Re:coded (USA v1.0) in 1:41:02.94 by arandomgameTASer. 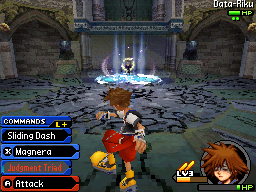 Kingdom Hearts Re:coded is a remake of the mobile game Kingdom Hearts coded, released in North America in 2011. It is notable for combining many elements from previous handheld games in the Kingdom Hearts series, in particular 358/2 Days and Birth by Sleep. In this run, watch as arandomgameTASer dodges, lunges, and yells his way through the game's various Disney inspired levels, abusing a surprising number of bugs and tricks along the way. Let's hope Sora finds a good masseuse. All encodes of this run come with the author's lengthy commentary. The YouTube encode removes the credits and its associated ending theme for copyright reasons.